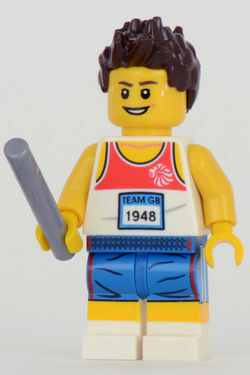 Relay Runner is part of the 8909 Team GB Minifigures series, introduced in 2012 to coincide with the Olympics. The Relay Runner has legs printed with white shoes, a band of yellow skin, and blue shorts. His white torso is printed with a red and white striped tank-top, with the Team GB logo on it in white. He wears a tag printed with the words "TEAM GB", and his number, "1948". He has bare yellow arms and hands. He has a smiling expression, and has brown eyebrows and hair. Like all Team GB minifigures, he wears a red and gold medal. 1948, the year on the Runner's tag, is the year the Olympics were last held in Britain before 2012.